Whatever obstacles he faced were quickly overcome as he showed much artistic talent by age nine. At 14 he was studying art with teachers Cayetano Capuz and Salustiano Asenjo. His first awards started coming at age 15, from the Academy of Valencia. This may have been the reason he was able to travel to Madrid when he was 18 to study painting at the infamous Spanish Museum, El Prado. After dedicating some time to his studies, Sorolla served in the military. But by age 22 he was freed from his duty and found himself painting in Rome, Italy. He followed this trip with a long stay in Paris where he was likely exposed to modern paintings by Jules Bastien-Lepage and Adolf von Menzel. In 1888, Sorolla returned to Valencia to marry the daughter of photographer Antonio Garcia. Before long, he and his wife, Clotilde, had three children: Maria, Joaquín and Elena. Sorolla’s career took him and his flourishing family to Madrid. It was there that his career began to take stride. During this era of life, his art was predominately focused on social subjects and historical happenings, as well as concepts that were considered mythological and oriental. He painted these works on large canvases and began to showcase them around the world. It could be said that Sorolla had a “big break” in 1893 when he submitted his work to the World’s Columbian Exhibition in Chicago. From there, in year 1900, he displayed art at Paris Universal Exhibition. Later, he was asked to showcase artwork at the Hispanic Society of New York, which would take Sorolla’s work on a tour of the United States. As a result of this honor, Joaquín Sorolla was invited to the White House where he sat President Taft for a portrait. In 1911, the Spanish painter was asked by the Hispanic Society of America to create a large piece of art displaying the customs and cultures that existed in various parts of Spain. Sorolla would spend the next eight years of his life consumed by this project before suffering a severe stroke. Three years after his stroke, Sorolla passed away on August 10, 1923. 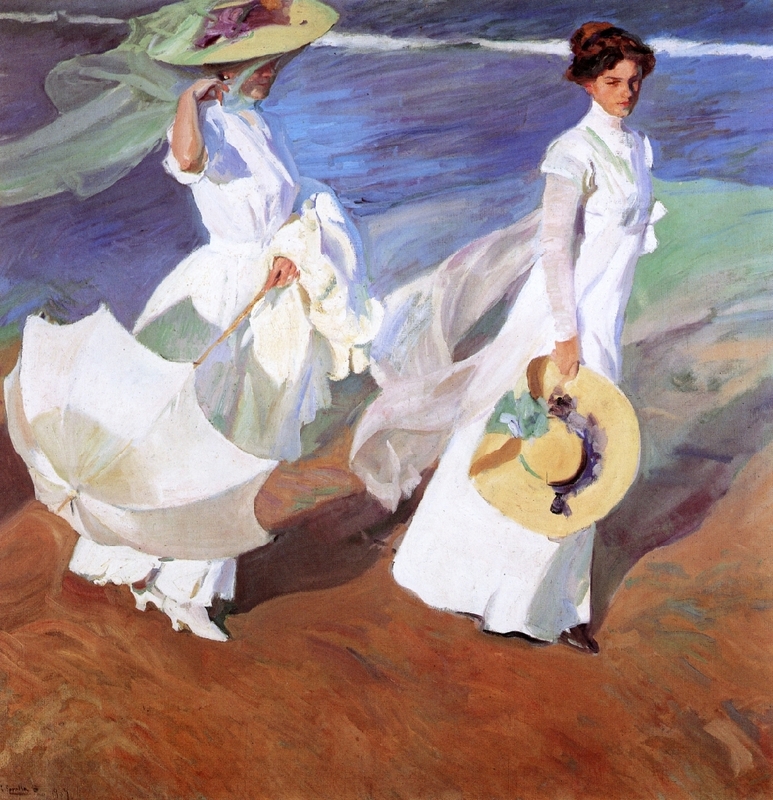 Today, the memory of Joaquín Sorolla lives on in art history. Unfortunately, some of his admirers believe he is not as famous as he ought to be. Aside from his little notoriety in the new millennium, the Spanish painter far surpassed the life that most orphans lived at the turn of the century. From his birth in 1863 to death in 1923, Joaquín Sorolla used his natural talent, drive and skill to promote his art and native land for the world to see. However, this post is meant to recognize his artist style and some major pieces. For those who want to read more of Joaquín Sorolla ‘s story, visit this link: http://www.segmation.com/products_pc_patternset_contents.asp?set=SOR . 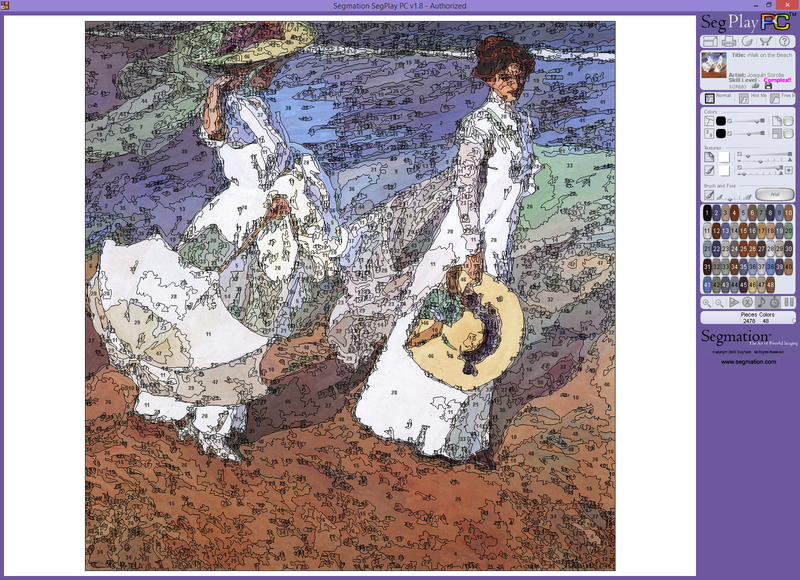 Also, Segmation is proud to offer 34 digital Joaquín Sorolla patterns. By downloading these paint by numbers masterpieces, you can emulate one of the most fascinating artists who ever lived. Enjoy the 34 Joaquín Sorolla Spanish patterns. Segmation has for you and continue to learn and celebrate the life of a great artist. This entry was posted in "out of the box" art, Hispantic Society, painting, Spanish Painter, worldwide travel and tagged art history, Casual Gaming, great artist, Historical Art, paint by numbers, painting, relacing, Spain, Spainish on August 26, 2014 by segmation.